As expected, Bodyguard needed a little dermatology to clear up her blotchy complexion. I added more layers of underglazes to the piece to even out her skin tone. To add depth and interest, I added underglazes in colors related to, but not the same as, the first layer to the girl’s eyes, tee shirt & hair, put more dark brown and black in the dog’s ears, and used a slightly different shade of black in the dog’s body. 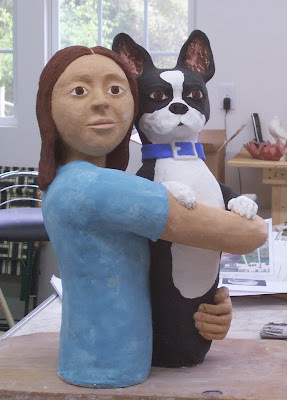 Kevin loaded her into the kiln yesterday–he was able to carry her from the studio this time. We still set up a pedestal for her to sit on before he lowered her in. Clay shrinks when it is fired, but she is still 20 inches tall. As I write this, Bodyguard is warming up in the kiln, preparing for her second firing, today.